Travis Ganong zips through downhill training for the Xfinity Birds of Prey Audi FIS Ski World Cup Wednesday, Nov. 28, in Beaver Creek. A torn ACL while racing the downhill at Bormio, Italy, sidelined the U.S. Ski Team’s Travis Ganong from the start of 2018 to August, when he finally got back on snow. 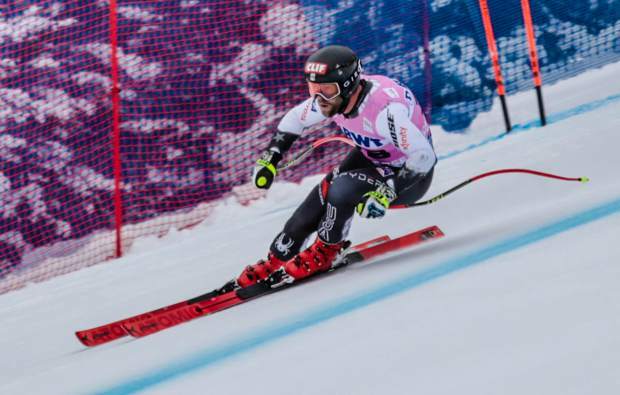 “I was just sitting there, (watching) from my living room …” Ganong said after his downhill training for the Xfinity Birds of Prey Audi International Ski Federation World Cup on Wednesday, Nov. 28. To start the season and his return to the World Cup, Ganong finished 38th in the downhill at Lake Louise, Alberta, and 17th in super-G. At Birds of Prey in Beaver Creek, Colorado, Ganong raced to a 15th-place finish in super-G and 28th in downhill. Still not at 100 percent, Ganong said, during the late November interview, he is still feeling soreness sometimes and is taking it easy while saving his chances for race days. Last weekend, Ganong posted his best finish of the year, taking sixth in downhill in Val Gardena, Italy. He entered the race after posting the fastest downhill time during training. Ganong also took 24th in super-G last weekend. The Vail Daily is a sister publication of the Sierra Sun. Assistant Editor Ross Leonhart can be reached at 970-748-2984 and rleonhart@vaildaily.com. Sierra Sun reporter Justin Scacco contributed to this report.